How does a VAT refund work? Subject to the different regulations and VAT rates, which vary from country to country, a company can receive a VAT Refund on business Travel & Expenses and Accounts Payable. We begin with extracting your VAT-related expenses or uploading via Excel. The local tax authorities require that the application and the communication are done in their own language. Global VaTax makes it convenient for your company to collect its VAT refund and manage its VAT registration. We communicate with the local tax authorities in their particular language and submit the necessary forms to the necessary tax authorities. For US companies, the original invoices must be submitted with the claim, including signed refund forms. The tax authorities process the claim, and after the claim is accepted, the client is refunded. What is the extent of the VAT refund recovery? Depending on the country and type of VAT, statutes of limitations range from 18 months to 5 years. So we recover not only your recent charges but also potentially going back many years. We provide a free estimate and will generate an interactive online FREE VAT potential analysis report. Can a private person get a VAT refund? Tourists can apply for a VAT refund on goods purchased but it must be requested at the last port before departure from the visited country. Private persons cannot get a refund of the VAT incurred on services, such as hotel and car rental. This refund opportunity is only available to companies. However, if the private person was charged and it was related to a business expense, our team can have the invoice reissued so that it can be reclaimed. We don’t keep original invoices. Can a US company still file for VAT refund? The US is part of the 13th directive which requires original invoices. We can work with your company to retrieve these invoices if you do not keep them. If necessary, we will also send a team directly to your regional office to collect original invoices. If legislation requires that your invoices need to be formatted differently, we will contact your supplier or vendor and make sure the invoices are reformatted to the compliant format. Inter Europe VAT reclaim does not require original invoices as it is part of the 9th directive. 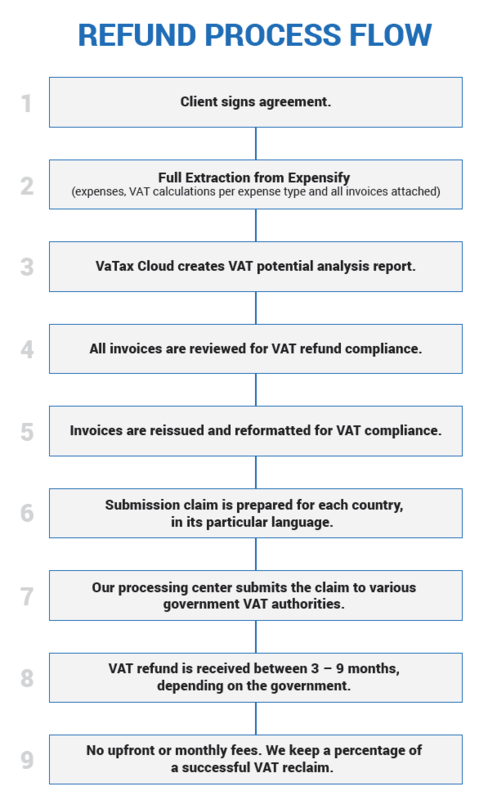 Why use Global VaTax’s management services for your VAT refund? VAT recovery is a complex process and requires a detailed understanding of the processes and requirements in each country, in its specific language. VAT rules vary from country to country. The local tax authorities require that the application and the communication are done in their own language. Global VaTax makes it convenient for your company to collect its VAT refund and manage its VAT registration. We communicate with the local tax authorities, and we understand and have experience with their unique requirements and rules. You will also have access to the VaTax Cloud encrypted private online portal where you can track progress, with live interactive data. We have the necessary knowledge and experience to expedite your claims for prompt returns and maximize payments. We can also assist with efficiently structuring your organization’s financial and operational processes for ongoing VAT registrations and management.